Hello everyone. For a quick update on the progress of the upcoming demo, It's on its way to being fully playable! Some important intro, gym leader, and locations still need to be made. 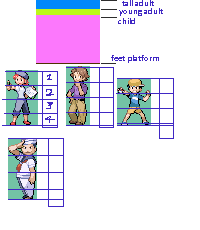 Otherwise, the biggest hurdle to jump over is replacing the placeholder graphics with official stuff (mainly our Aremon graphics and trainer graphics). You can use this characterset I made above as a model for this. The guitarist is a female punk rocker with a huge mohawk, cropped top and other edgy punk rocker things. The major requirement is that she has a guitar, obviously. These are young adults who decided to engage in battle with you despite being completely hung over. These guys should look a little dopey and wasted somehow, carrying a bottle or a flask would be a plus. Same as above, but these are the female variations. These are humanoid robots who serve as the grunts for Prof. Manic, as seen on the character page. I'm open to any ideas on these guys, but they should look as if they are definitely capable of storing commanding Pokemon for battle. They are robots with the same capabilities as an elite Pokemon trainer. - The sprite(s) should fit into a 64x64 square. 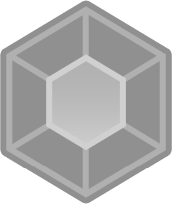 This is for consistency with some of the trainer graphics that are already in the game. - You can pick and choose which trainer(s) you'd like to sprite, you don't have to work on all of them at once if you don't want to. > Most teens/young adults tend to either top or fall somewhere in between the green area in the square. > Tall adults that stand upright tend to top off the blue area. > The "feet platform" is the space that typically isn't covered by any of the sprites, and is serves as the point where the character's feet don't cross. There are some exceptions, however. Keep in mind, these height charts are relative and even the official set of graphics contains exceptions, so do what works best for whatever character you choose! Payment for any of these sprites is completely negotiable. If you want payment for this to begin with, shoot me a PM. I thank everyone in advance for their time and interest! Any takers? I'll do it... FOR FREE! Thanks for your interest, jin! However, I'd like to see some examples of your work that at least shows that you've improved from your past attempts. Well... Pokemon is a tricky method of spriting, but sure I'll do one and PM you, ok? I sent it to your gmail last night. You know im more of a concept man. which is why i havnt been able to help much. but i love this game and wish i could help more. Just wanted to mention that these requests have been filled. Thanks!